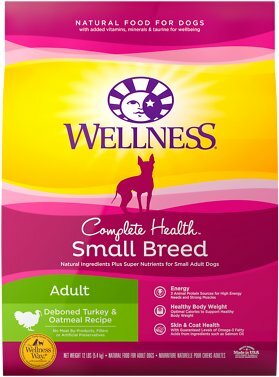 If your small-breed buddy likes to act like the big bark on the block, Small Breed Adult Recipe from Wellness has a flavor large enough to satisfy! Turkey, Chicken, and Salmon provide lean, quality protein, and wholesome whole grains give him all of the energy he needs to make it through a fun-filled day. The specific small-breed formula has the optimal caloric count to support his body weight, and a big helping of Omega 3 and 6 fatty acids to make the little fur ball's coat shine. 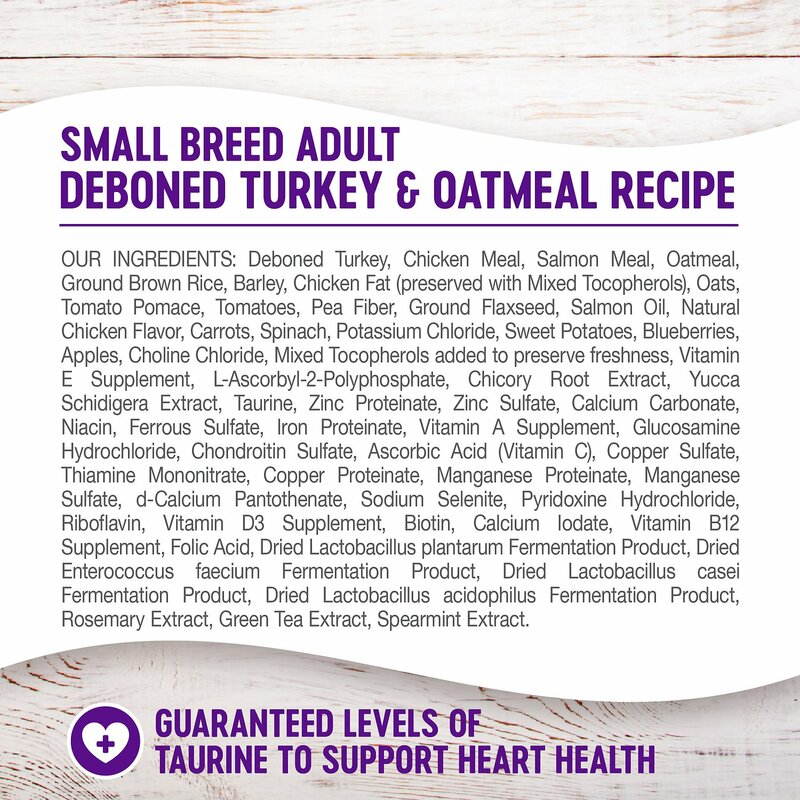 New Formulation: Deboned Turkey, Chicken Meal, Salmon Meal, Oatmeal, Ground Brown Rice, Ground Barley, Rye Flour, Chicken Fat (Preserved with Mixed Tocopherols), Menhaden Fish Meal, Tomato Pomace, Natural Chicken Flavor, Pea Fiber, Tomatoes, Salmon Oil, Ground Flaxseed, Carrots, Spinach, Potassium Chloride, Apples, Sweet Potatoes, Blueberries, Vitamin E Supplement, Mixed Tocopherols Added to Preserve Freshness, L-Ascorbyl-2-Polyphosphate, Taurine, Zinc Proteinate, Zinc Sulfate, Calcium Carbonate, Niacin, Ferrous Sulfate, Iron Proteinate, Yucca Schidigera Extract, Beta-Carotene, Glucosamine Hydrochloride, Chondroitin Sulfate, Chicory Root Extract, Vitamin A Supplement, Copper Sulfate, Thiamine Mononitrate, Copper Proteinate, Manganese Proteinate, Manganese Sulfate, D-Calcium Pantothenate, Sodium Selenite, Pyridoxine Hydrochloride, Riboflavin, Vitamin D3 Supplement, Biotin, Calcium Iodate, Vitamin B12 Supplement, Folic Acid, Ascorbic Acid (Vitamin C), Dried Lactobacillus Plantarum Fermentation Product, Dried Enterococcus Faecium Fermentation Product, Dried Lactobacillus Casei Fermentation Product, Dried Lactobacillus Acidophilus Fermentation Product, Rosemary Extract, Green Tea Extract, Spearmint Extract. Old Formulation: Deboned Turkey, Chicken Meal, Salmon Meal, Oatmeal, Ground Brown Rice, Ground Barley, Rye Flour, Chicken Fat (Preserved with Mixed Tocopherols), Menhaden Fish Meal, Tomato Pomace, Tomatoes, Natural Chicken Flavor, Carrots, Pea Fiber, Ground Flaxseed, Salmon Oil, Potassium Chloride, Spinach, Vitamins [Vitamin E Supplement, Beta-Carotene, Niacin, D-Calcium Pantothenate, Vitamin A Supplement, Riboflavin, Vitamin D3 Supplement, Vitamin B12 Supplement, Pyridoxine Hydrochloride, Thiamine Mononitrate, Ascorbic Acid (Vitamin C), Biotin, Folic Acid], Minerals [Zinc Proteinate, Zinc Sulfate, Iron Proteinate, Ferrous Sulfate, Copper Sulfate, Copper Proteinate, Manganese Proteinate, Manganese Sulfate, Sodium Selenite, Calcium Iodate], Choline Chloride, Mixed Tocopherols Added to Preserve Freshness, Apples, Sweet Potatoes, Blueberries, L-Ascorbyl-2-Polyphosphate, Taurine, Glucosamine Hydrochloride, Chondroitin Sulfate, Chicory Root Extract, Yucca Schidigera Extract, Dried Lactobacillus Plantarum Fermentation Product, Dried Enterococcus Faecium Fermentation Product, Dried Lactobacillus Casei Fermentation Product, Dried Lactobacillus Acidophilus Fermentation Product, Rosemary Extract, Green Tea Extract. 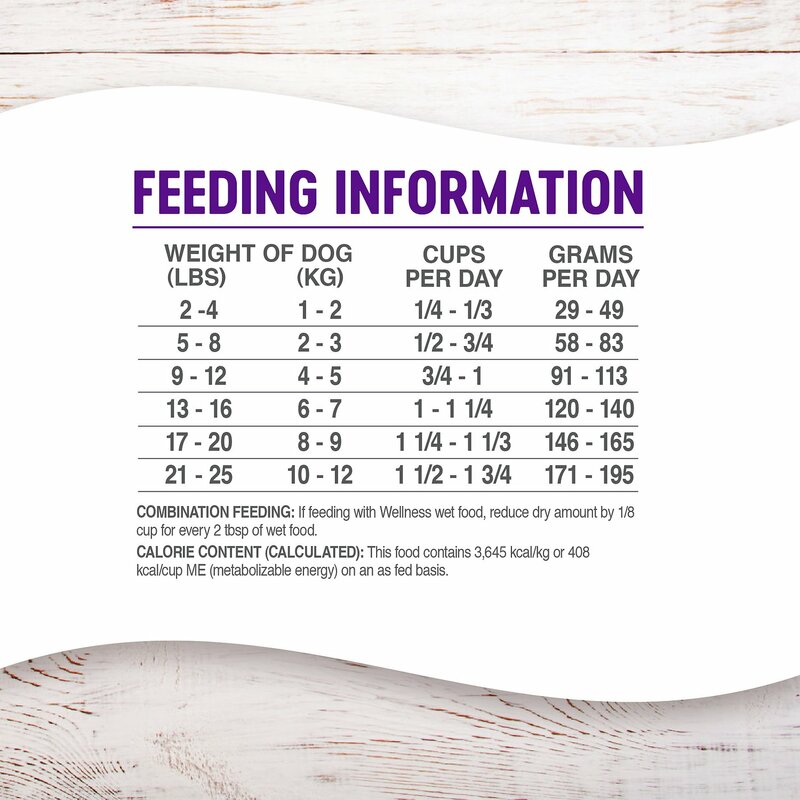 It is important to slowly transition your dog from his/her current diet as it takes a few days for the body to adapt to the new nutrient levels. To transition, gradually mix in the new food over a 5 - 7 day period, increasing the amount of Wellness each day, so that you are feeding 100% Wellness by day 7. 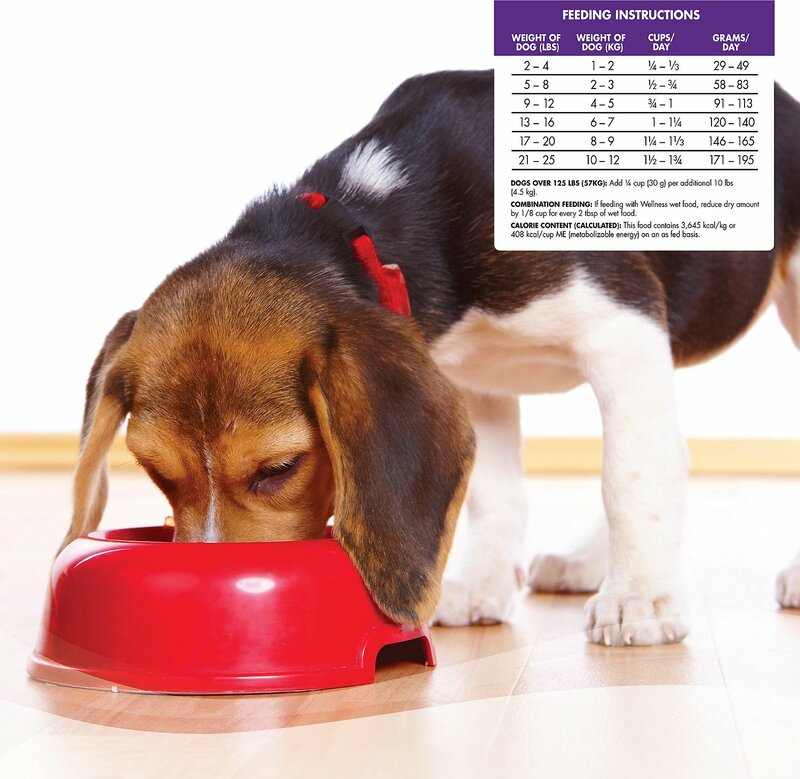 Small breed dogs are known for their discerning palates and long life spans. Wellness uses real meat and fish to provide a natural taste little dogs love along with antioxidant-rich fruits and veggies to help support cellular health. Live, naturally occurring microorganisms support small breeds' digestive health while a WellCoat® Omega-3 and Omega-6 mix ensures nourished skin and a healthy coat. 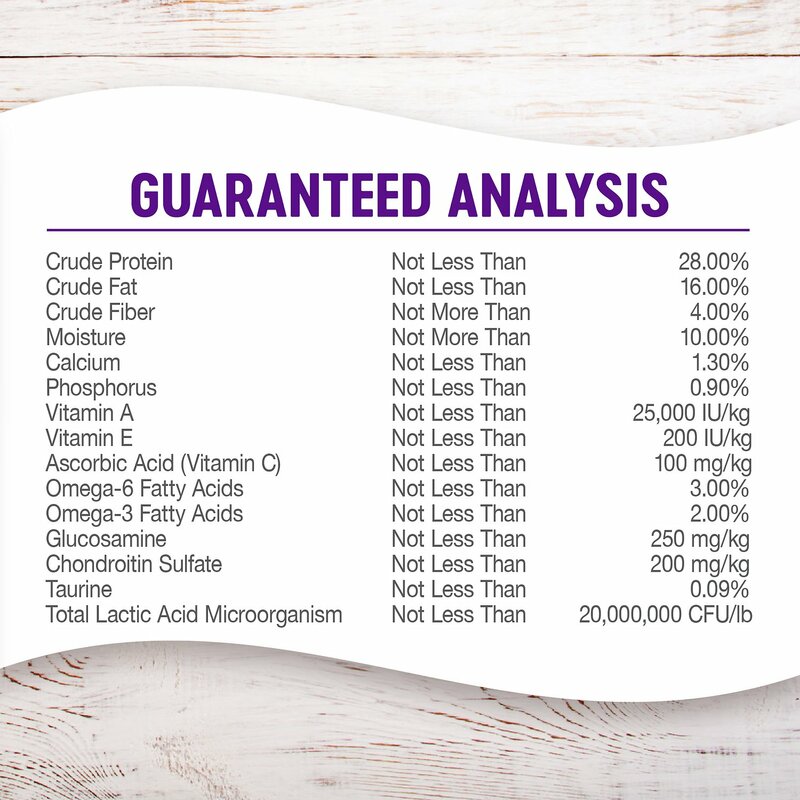 Wellness Complete Health recipes are carefully formulated with natural ingredients and super nutrients to provide whole-body nutritional support. Each tasty recipe is designed to be easily digestible and features quality protein and Omega-3 and 6 fatty acids. 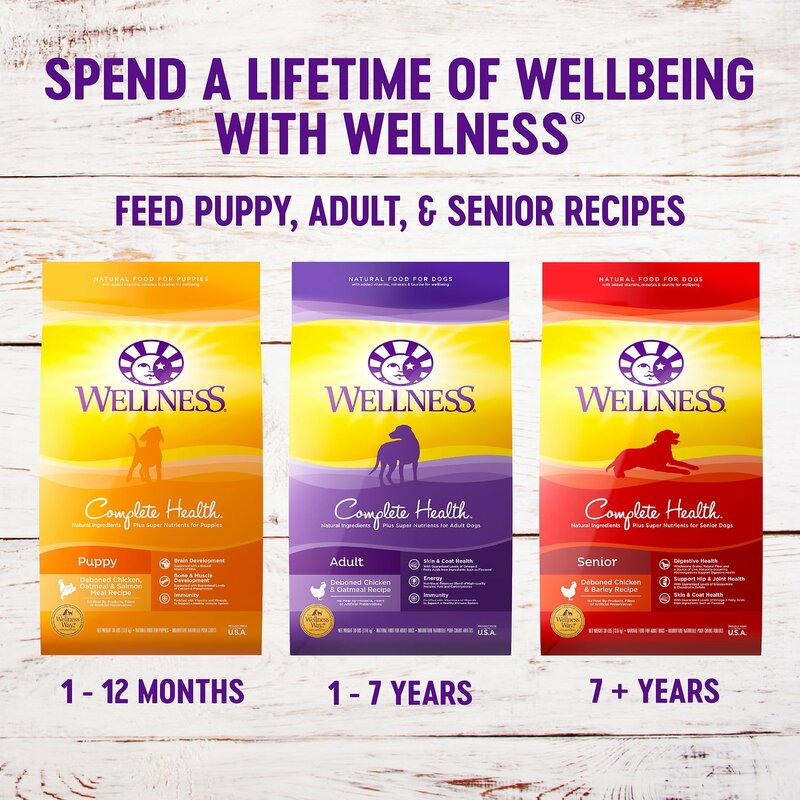 Available in a variety of sizes and flavors, Wellness Complete Health provides uncompromising nutrition for your pet's unconditional love. 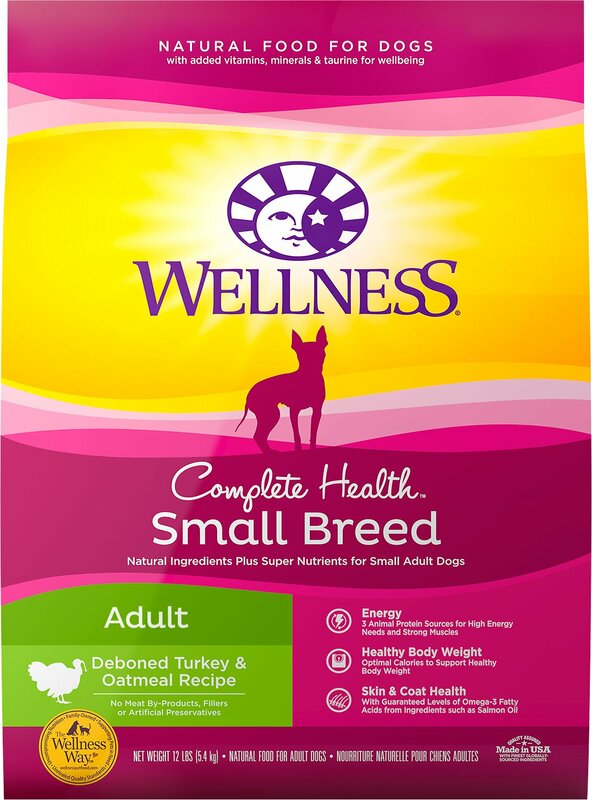 Wellness Complete Health helps pets achieve five signs of wellness that stem from balanced, natural nutrition. These recipes contain no meat by-products, artificial colors, flavorings, preservatives, corn, wheat or soy. Excellent source of highly digestible carbohydrates, protein and nutritional fiber and also contains iron, essential fatty acids, manganese, zinc and B vitamins. Excellent source of complex carbohydrates, vitamins, minerals and beta carotene. The starch in sweet potatoes converts to sugar easily and provides quick energy. Excellent source of fiber and minerals and a good natural source of beta carotene, an antioxidant essential for neutralizing free radicals. Great source of vitamin C, vitamin E and potassium and especially rich in the carotenoid lycopene, which is an important antioxidant known to promote good health. My dog is NOT PICKY. He will even eat - lettuce!! He does not like this food. I hate that it seems to have a dust!! Never have I seen this on a food. And I've had many dogs for 30yrs. I got the kind for small dogs. My 12 lb dogs have always been considered -- small. But I think this is as small as dry food for a cat. There is nothing I like about it. I bought this recipe for my toy poodle who is very picky. I thought since it had oatmeal she might like it better than diamond natural toy breed chicken and white rice. She will not eat much of either one. She wants the diamond natural all life stages chicken and brown rice that I give to my larger dogs. I think because of the brown rice. 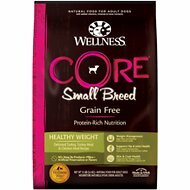 My larger dogs will eat the wellnes food so it won't go to waste. Love this brand of food! I have a 1 year old westie that I've had on Wellness since we got her at 2 months of age. She is a little picky about her food, but Wellness has held up from the start and she loves it. I also love the size of this kibble too! I have a chihuahua, a dachshund, and a papillon and they all love this food. The size of the food is adequate for them. I mix this with Wellness wet food as well. My fur baby loves her new food. My fur baby loves her new food. Since she's no longer a puppy, I need to change her food. I must say, we're happy about the change! This is a great size to order and give my dog. Wellness is nutritious and gives my little girl what she needs to stay healthy. This is the only food I feed my 3 daschunds, it is good for them with nutrients, no fillers, and they love it..